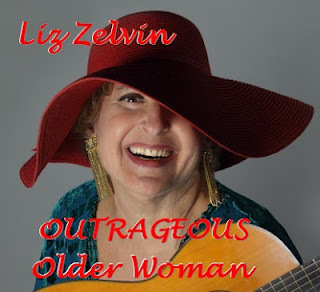 As some of you know, I’ve recently released an album of original songs, Outrageous Older Woman. While I’m an experienced writer who knows as much as any author can claim to about today’s rapidly changing book publishing marketplace, this is my first foray into the recording industry. I’m not looking for a record deal or an American Idol career. At my age, and at my modest level of musicianship, I’m happy to have my songs out there in the world and accessible to those who might enjoy them. And I did get a double handful of terrific musicians and harmony singers to play and sing along. I’ve met a fair number of independent singer-songwriters over the years, so I was not surprised when my co-producer on the album, who actually makes a living from his music, confirmed that the best place to go for distribution of indie music is a website called CD Baby. For a small fee—which in fact was paid by the company that made and packaged my CDs—they offered a user-friendly way for listeners to preview excerpts of the songs and buy either the CD or mp3 downloads of the whole album or individual songs. This can be done on either my CD Baby page or a click-through embedded in my own music website. And for no extra charge, CD Baby handles digital distribution to iTunes, Amazon, and numerous other music vendors on the Internet. All I had to do was sign up with CD Baby by completing their online registration and send them five copies of my CD. So far, so good. I was pleased they asked for information I thought it was important for music lovers to know, such as a description of each song. I had already done some thinking about what musical genres to check off in order to attract folks who would actually enjoy my music: urban folk, country-folk, acoustic singer-songwriter, and (coached by my co-producer, who’s an old hand at this) “roots” and “Americana”—designations for music that isn’t slick and formulaic enough, not Nashville enough, to be played on commercial country stations. I even managed to come up with the requested “three names of famous artists whose music yours is like.” I’ve always had trouble with this stuff with my fiction, since I don’t think my work is quite like anybody else’s. (“If you crossed Matt Scudder with Stephanie Plum, you might get my recovering alcoholic protagonist Bruce Kohler’s third cousin.”) So I hope no one is too disappointed when they hear my music after reading that I’m like Joan Baez, Judy Collins, and the Dixie Chicks. At least we’re in the same ballpark. But one phase of the registration process knocked me for a loop. For every one of the sixteen songs on the album, I had to check off whether it was “clean” or “explicit.” Now, I’m a word person, and I know that “explicit” does not mean “dirty.” If you ask me to be explicit about my origins, I can tell you that I’m a nice Jewish girl from Queens, the daughter of immigrants from Hungary and Russia. To be explicit about my favorite meal, I can describe the cut of meat and its degree of doneness and exactly how I like my potatoes prepared. But I’m no dummy, and I know they meant “explicitly obscene” or “explicitly profane”—in other words, is each song suitable for young children to hear, or is it dirty? Independent labels that are not RIAA members are not required to use the sticker. A 2007 message board post on the subject that popped up when I googled “CD Baby + RIAA” said, “I suspect that over 99% of the users of...CD Baby...are NOT RIAA members.” (gearslutz.com) But CD Baby itself does comply with the advisory. Once I knew what to look for, it was easily found in the contract I signed in order to use CD Baby’s services. Parental Advisory Labeling. You will be responsible for complying with the Recording Industry Association of America’s (“RIAA”) Parental Advisory Logo (“PAL”) Standards, as applicable, for so long as you use the Services. So I guess I’m not gonna try to boost my record sales by adding “explicit” language to my lyrics. Click below to listen to the previews, and see if you like ‘em. Liz, good luck and great photo! Very best of luck with your CD. Hey Liz -- Sincere congrats on the CD! Interesting stuff. Way to go, Liz! Congrats and best of luck! Someone's always censoring something, Liz! I also spotted your album on Angela Zeman's site. Congratulations!